What is the Jiankou Great Wall of China? Located around 30 kilometers away from Huairou County, Great Wall of China (Jiankou) is 1,141 meters high. 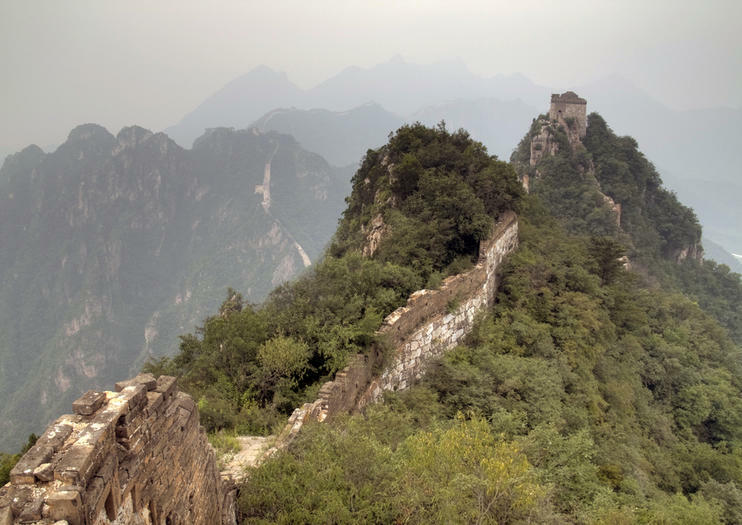 It is one of the most famous dangerous sections of the Great Wall of China in the Ming Dynasty (1368 - 1644). It has always been a hot spot for photography. The Great Wall of China (Jiankou) winds in a shape of “W”. Great Wall of China (Jiankou) is situated some 10 kilometers west of Great Wall of China (Mutianyu). Since the completion, it has not been rebuilt for hundreds of years. The Great Wall (Jiankou) is divided into the north section, the middle section and the south section. Although it is the most dangerous section, the middle section offers the most stunning landscape of the Great Wall of China (Jiankou). It offers several amazing highlights, such as Beijingjie, Yingfei Daoyang, the Ladder to the Heaven, General Guard the Pass and etc. Plenty of hikers always explore the south section. Visitors can explore the Little Budala, Zhengbei Tower, and Suobo Tower. Among them, the small Budala is the most famous, suitable for shooting the steepness of the Great Wall (Jiankou). The southern end is connected to the Great Wall of China (Mutianyu). The north section is from Nine Holes Tower to Beijing. There are several scenic spots, such as Xidaqiang and Er’ Dao Bianzi in the section. The road in the section is easy to walk on. Every spring, peach trees on both sides of the walls in this section are in blossom. It is suggested that you spend one day exploring one section of the three sections and spend two days discovering two sections of the three sections. It always takes visitors 4 hours at lest to climb the Great Wall of China (Jiankou). Therefore, if you are planning to visit it for photography purpose, the best time to visit is in the afternoon. After you reach on the top of the Great Wall of China, the sun will set in the west. The best months to visit it are from March to June and from September to November. There is no direct bus from Beijing to Great Wall of China (Jiankou). Therefore, there are only a few options. Rent a vehicle from Beijing. This is the quickest and most direct option. Take Bus 916 at Dongzhimen to the Stop of Yingbin Road (迎宾路站). Then, transfer to Bus 862 to the Stop of Yujiayuan (于家园站, there are 2 stops called Yujiayuan. Please get off at the second one). At last, transfer to Bus H25 to the Stop of Xizhazi Village (西栅子村). The Great Wall of China (Jiankou) hasn’t been rebuilt and some parts of it are damaged. Therefore, please take care of yourself. Please bring enough drinking water and food with you. Please do not explore it on your own for the safety. It is not for those whose conditions are not good. Interested in hiking the Great Wall from Jiankou Great Wall of China on a Tour? Wendy Wei Tours offers a variety of different packaged tours as well as custom tours including Jiankou Great Wall of China, among other attractions and destinations. To find out more, please visit our Tours page or Contact Us directly to find out more.